Her true name was Ordana of the Meadow, but history remembers her by many other appellations. Ordana the True was one of them. The Scarlet Paladin in White Satin, the Defender of the Meek, the Just Princess of the United Sovereignties, the Champion of the Southern Kingdoms, and the Merciful Mistress of the Seven Regiments were others. 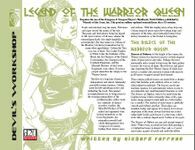 But most people remember her simply as the Warrior Queen. This four-page Weapons and Equipment PDF is easy-to-integrate and just the sort of thing needed for DMs to add depth to any great d20 fantasy campaign world and gaming session.